NEW YORK—Explaining that the numerous bombshells in store would be far too much to attempt to cram into one episode’s worth of filler, Rachel Maddow claimed Thursday that their newly released recording of Representative Devin Nunes would be damning enough to pad out an entire week’s worth of shows. “This is big, folks—so big that it is the only thing I will talk about for the next week. 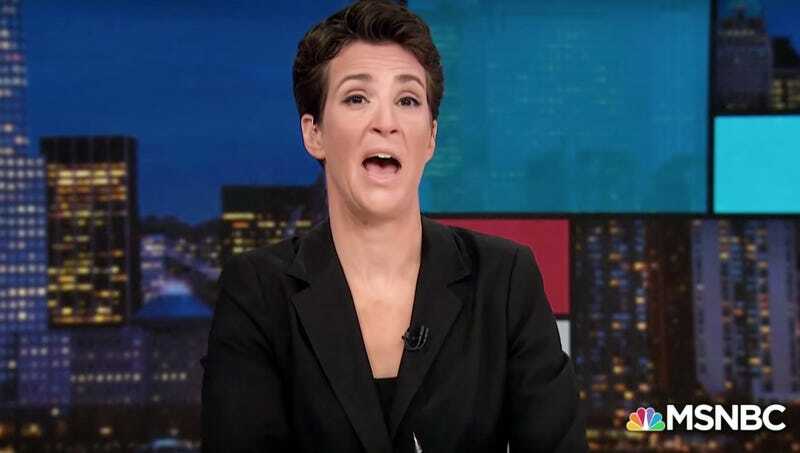 We’ll need at least five hour-long episodes to parse this out ad nauseam,” said the political commentator and host of “The Rachel Maddow Show,” describing to viewers the upcoming series of episodes devoted to unnecessarily breaking down and scrutinizing every minute detail of the audio recording and the multitude of possible repercussions it could have on the ongoing Russia investigation, as well as featuring a rotating slate of experts to bloviate on the topic. “This is an absolute game changer that will provide me with weeks—maybe even months—of over-elaborating. Believe me, this is so important, so packed with suggestive details, that we will refuse to cover any other news story that breaks, no matter how big. I will report on this audio, and only this audio, so stay tuned.” At press time, MSNBC had given the recording its own spinoff show.